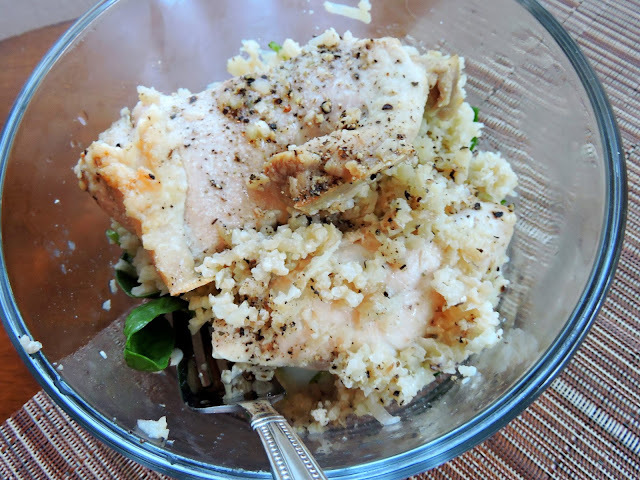 I'm back with another "one-dish meal"... my favorite way to pull together a delicious dinner with minimal effort! This recipe was something I threw together on a whim on the last day of our Whole30. 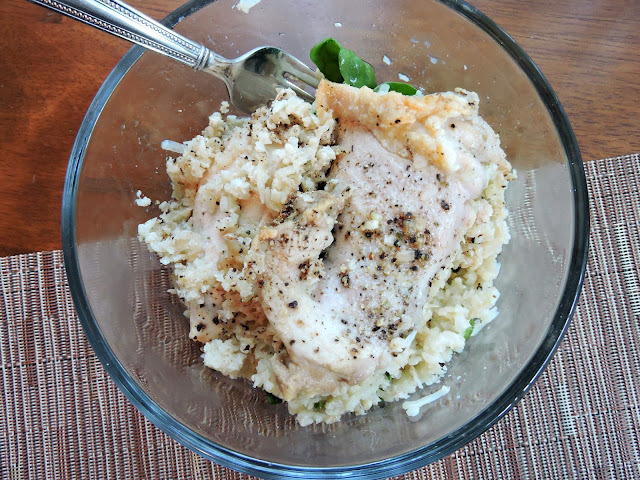 The weather was chilly, and I was craving creamy, home-style comfort food that would be easy to make on a weekday work night. I decided to go for this... juicy baked chicken that cooks over creamy cauliflower rice. I kept it simple, just to test it out, but immediately thought of all the different ways I could change up this dish. Craving Thai food? Throw in some Thai spices (listed below) with some broccoli and sliced red bell pepper to simmer with the rice as it all cooks. Thinking more of a spicy, Mexican-style vibe? Try adding diced green chiles & smokey spices like cumin & chili powder. Another version I personally can't wait to try involves sliced crimini mushrooms & crumbled bacon... The perfect savory touch to this creamy & comforting dish. Let me know if you give this a try, and what flavors you decide to go for! I hope you enjoy! Preheat the oven to 375ºF. Grease a 9 x 13" baking dish with butter or ghee to prevent your "rice" from sticking. 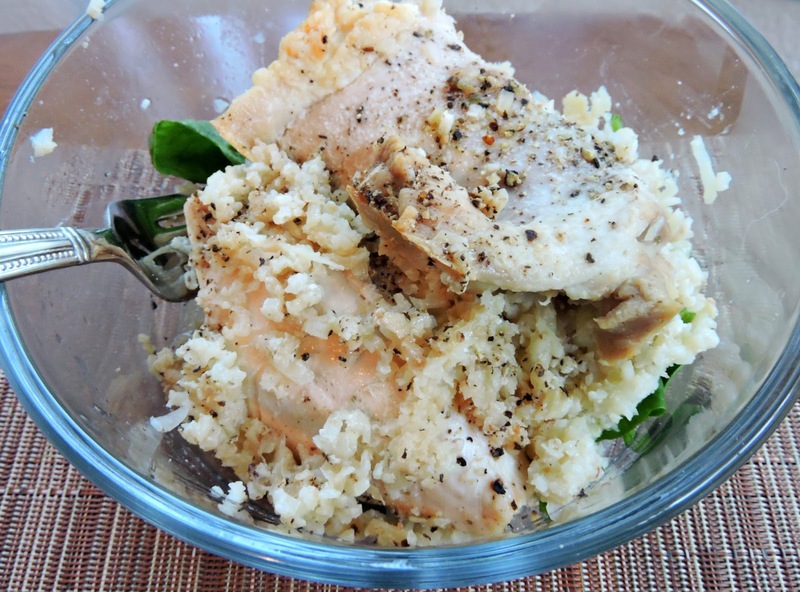 Use a food processor with a grating attachment to shred or "rice" your cauliflower. See my tips & how-to post here for more help with this step. Spread your riced cauliflower evenly into the bottom of the baking dish. Season with salt & pepper. Place your chicken pieces on top of the cauliflower. Sprinkle your seasonings over top (I used salt, pepper, garlic, onion, & an Italian blend to keep it simple). Drizzle the coconut milk and olive oil evenly over the top of the dish. Transfer to the oven, and bake for 50-55 minutes, or until juices run clear. You can cut into a piece of chicken to check if it's pink, if you're feeling unsure.